Beautiful engraved RARE specimen certificate from the Charles River Embankment Company dated in 1890. 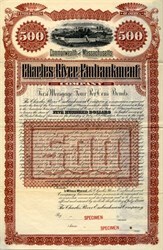 This historic document was printed by American Bank Note Company and has an ornate border around it with a vignette of Dam. This item is over 117 years old. 10 coupons attached on right side. "The Charles River Embankment Company, incorporated in 1881 by a group of owners of property on the Cambridge bank of the Charles River, persuaded the Legislature in 1887 to authorize the cities of Cambridge and Boston to build a new bridge across the Charles that would conect West Chester Park in Boston with Massachusetts Avenue in Cambridge. This bridge, named in honor of John Harvard, was opened to public travel in the autumn of 1891." Harvard Bridge (also known locally as the "MIT bridge" or the "Mass Ave bridge") is the longest bridge over the Charles River. One end of the bridge is in the city of Boston, Massachusetts, and the other at the campus of MIT in the city of Cambridge.